This is particularly true for Japanese artist Yayoi Kusama, known for her polka-dotted installation pieces. Early in her career in the 1960s, Kusama was known primarily for her staging of “happenings” (which can be described loosely as events similar to performance art) in New York City where she and other participants would protest the Vietnam War and other societal inequalities in popular public areas while naked and covered in polka-dots. 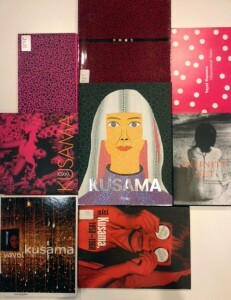 As her reputation grew through her happenings, Kusama took the opportunity to launch her own fashion line in 1969. Just as her art was charged with her opinions on society and filled with polka-dots, so were her fashion pieces. Many of them were meant to make a statement, usually through strategically placed holes in the garment, and were clearly not made for practical wear. She sold her pieces through various high-end department stores and boutiques and even opened her own store in New York City. Fast forwarding to July 2012, Yayoi Kusama continued to find herself attracted to the world of fashion when she collaborated with high end fashion label Louis Vuitton to design, but of course, a line of polka-dotted products. While seemingly less politically and socially loud than her previous fashion line, the polka-dots are not just decorative, they have always held a particular meaning to Kusama. The dots, or “infinity nets” as she sometimes refers to them, represent the universe. In her 2011 autobiography, she referred to herself as “one polka dot: a single particle among billions.” (24) She continued by stating when participants were painted with polka-dots in her happenings, it allowed “the person’s self to be obliterated and returned him or her to the natural universe.”(102) The Louis Vuitton youtube page still has several short videos displaying her and some of her work in conjunction with the launching of the line. Curious to find out more behind Yayoi Kusama’s use of polka-dots and whether your Louis Vuitton purse is saying more than you realize? The Hirshhorn Library has her autobiography and more publications available for further research. While you’re at the Hirshhorn, be sure to check out the Yayoi Kusama’s fashion week appropriate Flower Overcoat on view on the second floor. Kusama, Yayoi. Infinity Net: the Autobiography of Yayoi Kusama. Translated by Ralph McCarthy. London: Tate Publishing, 2011. 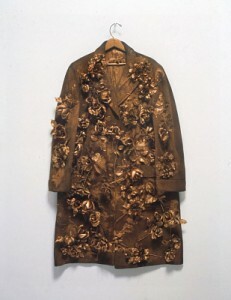 Thanks for the information about art and fashion, really open my mind to explore everything about art.